Meet Frost. She is looking forelorn. She can't find a friend to play with. She's waiting patiently for her friend. I made this wonderful snowgal with a whimsical touch. 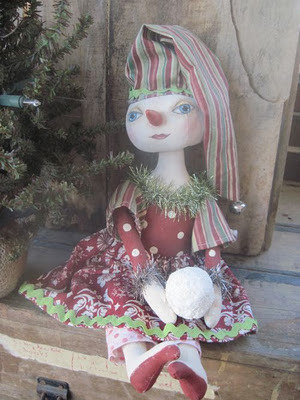 She has hand painted eyes and mouth, clay nose and is carrying a glittered snowball. Vintage tinsel adorn her dress and as you can see, she loves polka dots. You can find her at my etsy shop here: http://www.etsy.com/shop/snugglebugblessins Hope to see you there. One of the new things I am trying is blackened beeswax tart and more. 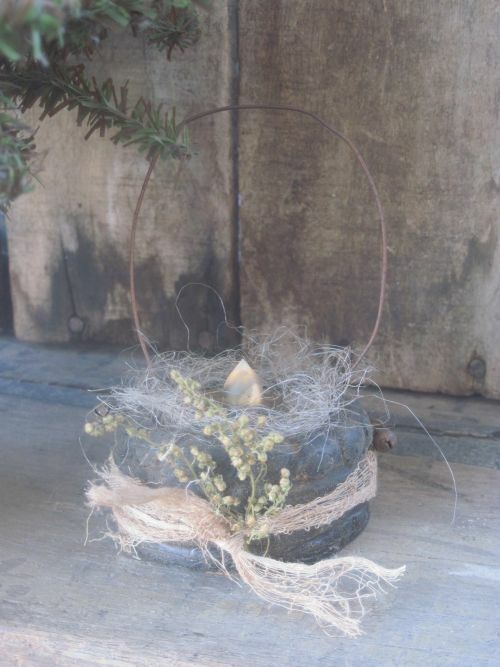 I love how this darling basket with a tealight inside came out. It is very primitive. I rubbed a mixture of spices to add a more prim touch and they also scent it just wonderfully. You can find them at my Etsy shop too! More wonderous Christmas primitives are on their way. Hope you can stop by for a visit. God bless.